This stout combo fits perfectly in hand, offering double the utility with a fixed blade knife fitting snugly into the handle cavity. WIth Gerber's renowned Gator Grip offering unparalleled comfort on both tools and a forged steel axe head, you will quit long before your tools do. Axes have been around for ages. And even our award-winning axes are hardly new. This stout combo fits perfectly in hand, offering double the utility with a fixed blade knife fitting snugly into the handle cavity. 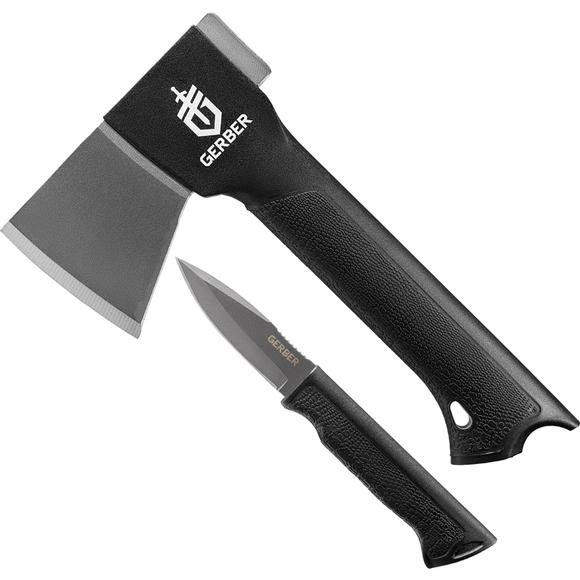 WIth Gerber&apos;s renowned Gator Grip offering unparalleled comfort on both tools and a forged steel axe head, you will quit long before your tools do. Axes have been around for ages. And even our award-winning axes are hardly new. But the Gator Axe is a wood-bustin&apos; breakthrough. Because we applied our proprietary Gator textured rubber to the grip for an unprecedented level of comfort and control. Beneath that tactile rubber surface is a virtually indestructible glass-filled nylon handle. And inside that handle is a hollow area containing a magnet that can hold a knife. The axe head is engineered from forged steel, which does an outstanding job of keeping its edge. Blade Length Axe: 2.70", Knife 2.88"
Overall Length Axe: 8.75", Knife 7.01"